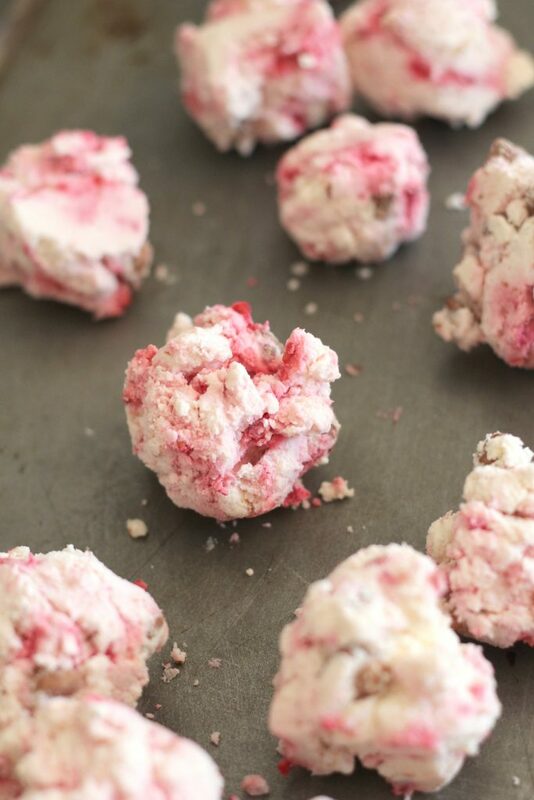 These raspberry chocolate chip frozen cream cheese bites are a great low carb snack! They are awesome for cooling off in the summer and for when that need for something sweet hits! First off, I’m in love with frozen cream cheese bites. They are definitely my sweet treat of the summer. And since summer in Arizona lasts from April to November, I suspect there will be no shortage of frozen cream cheese bite flavors to come. This week I am all about raspberries and chocolate. Raspberries were dirt cheap at the grocery store this week and I stocked up. By stocking up, I mean that they will last three days instead of one, since the kiddos seem to devour them before I get to them. I tried a new sweetener with these cream cheese bites. Typically I use powdered Swerve, since it freezes pretty well and tastes close to real sugar. This time I tried monk fruit sweetener and I really enjoyed it. It didn’t see a powdered version at Sprouts, so I threw some in the blender to pulverize it a little more before using it in the recipe. It comes in a liquid, so I’m going to try that in future recipes. As before, I used Lily’s Baking Chips since they are my favorite sugar-free chocolate. Once all the ingredients are combined, I put the whole bowl into the fridge for an hour or so to firm up. This makes it easier to scoop and lets the sweetener absorb into the mixture a bit. I attempted to get each ball to equal about 1 heaping tablespoon. 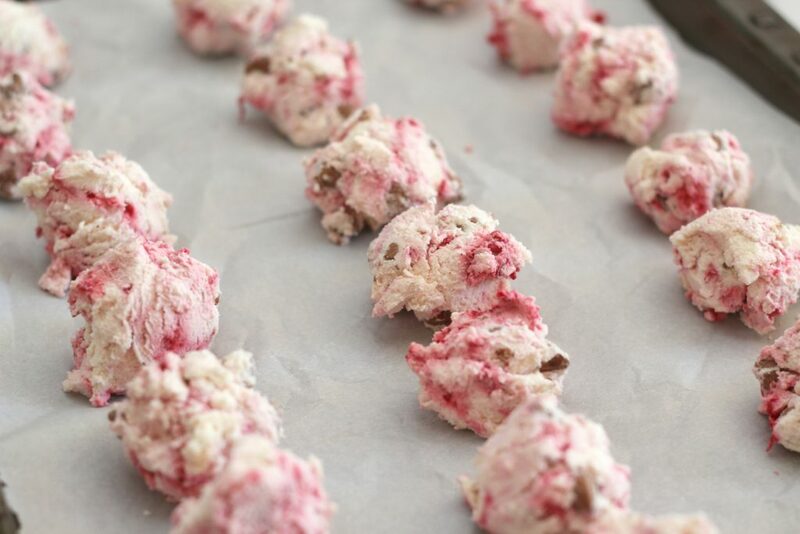 A one or two tablespoon scoop would probably be really helpful for precise measuring, plus the raspberry chocolate frozen cream cheese bites would look prettier. Combine all ingredients in a bowl and mix well. Refrigerate for one hour. After chilled, scoop approximately one tablespoon scoops and place onto baking sheet lined with parchment or silpat. Freeze for 1 to 2 hours, then transfer to a container with lid. Keep and eat frozen! THE PERFECTTTTT cool down bite for the hot summer days!!!! You had me at cream cheese and chocolate! I may try these soon, but with strawberries, since I don’t care for raspberries. These look perfect for my beach vacation next month! This is totally the best choice for dinner dessert. They look delicious and easy to make, thank you for sharing it. These look so tasty. 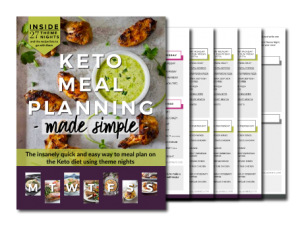 I have a bunch of friends that are on the keto diet right now so it is always nice to have options for them. Yum! Loving the idea of low-carb frozen treats. It’s better to indulge when they’re healthy 🙂 Plus, ZERO guilt. These look delicious. I’m now having ideas on adding chocolate frosting lol! I’m not low-carb obviously hahahah! 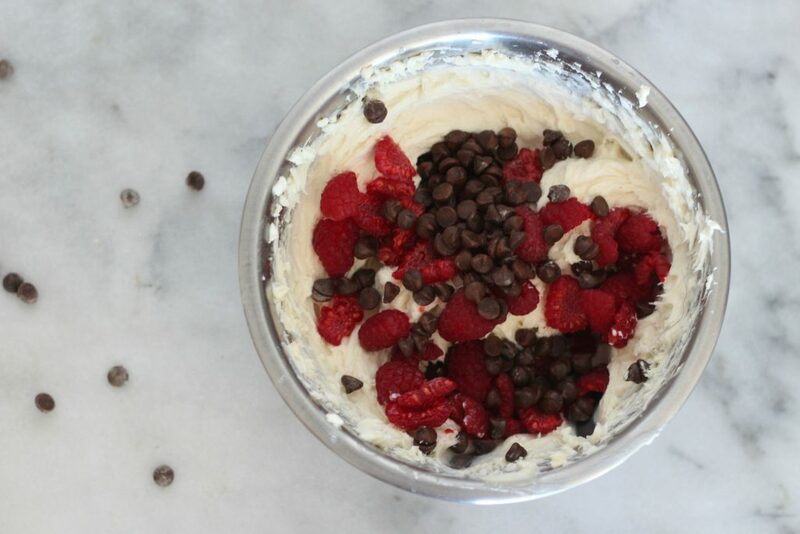 Raspberries, chocolate and cream cheese, together… Thanks, this is a wonderful idea! I love that these are frozen! It makes them the perfect snack to cool down with in the summer. They would also be great for summer barbecues and parties. 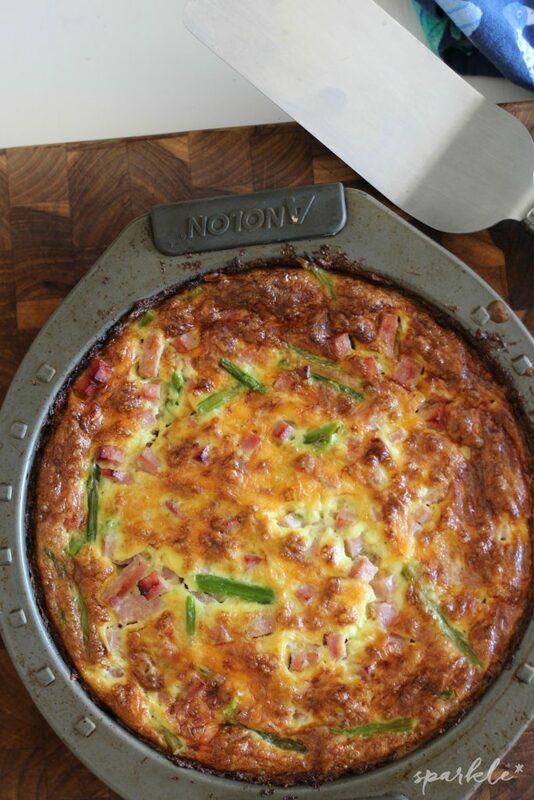 Thanks for sharing your delicious recipe with us at Merry Monday this week! These sound delicious! I love raspberry and chocolate together. Pinned! 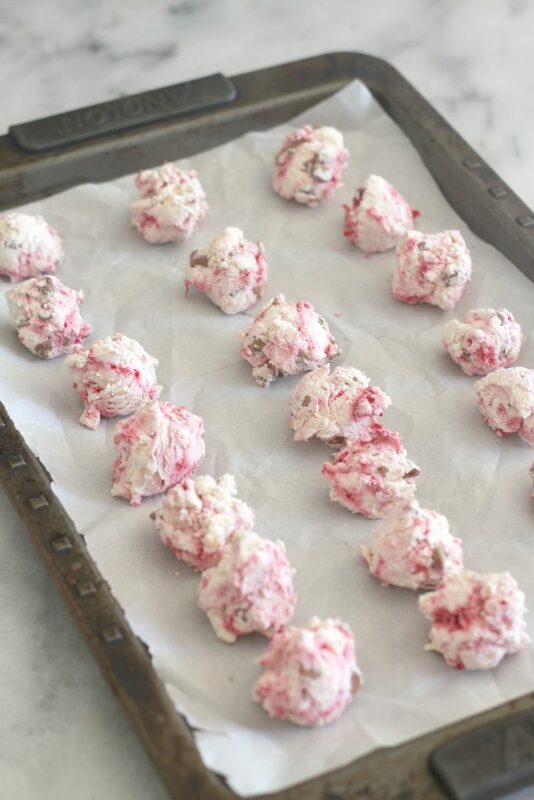 These raspberry chocolate chip frozen cream cheese bites sound Delish!!! What a fun little treat to cool down with. I am anxious to try them. Pinned and shared. Thank you for sharing at Tasty Tuesdays. 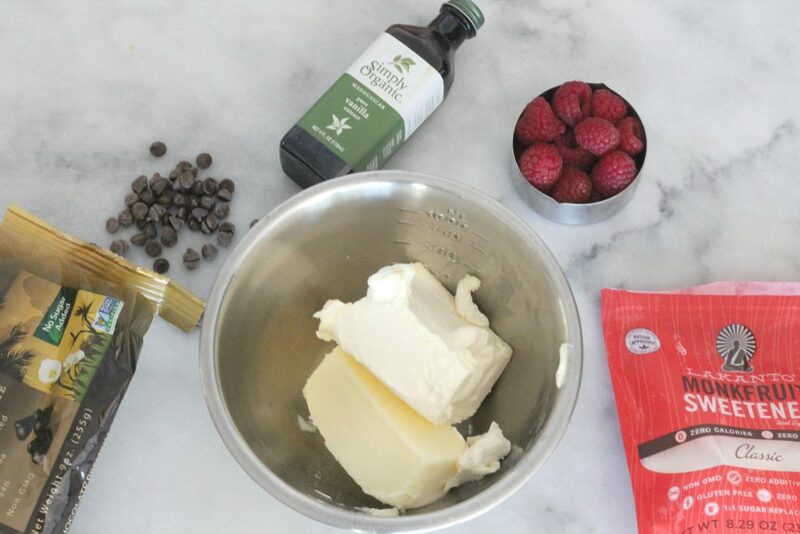 I saw this recipe and you had me at raspberry! I can’t wait to try this and for 5 mins of work – dessert never sounded so good! YUM! 3 of my favorite foods all rolled up in one sweet bite. Thank you for sharing at this week’s Encouraging HEarts & Home blog hop. This will be perfect for hot summer days! Thanks for sharing it! These sound like they taste like little cheesecake bites! yum! Thanks for sharing with Thursday Favorite Things! We are so happy you joined us. I am featuring you this week! Angelina @ Petite Haus. Thank you for sharing your tasty recipe on Oh My Heartsie Girls WW last week! What a fabulous summer treat! I am featuring it tomorrow morning in a blog post for the Summer Time Fun Link Party Features. Thank you for joining in the fun of the link party!